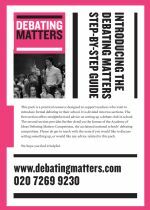 Since 2002 the Academy of Ideas Debating Matters Competition has pioneered a distinctive approach to schools Sixth Form debating that emphasizes substance over style. The unique features of Debating Matters can make it a transformative experience for students, and we know this because many of our alumni tell us so. 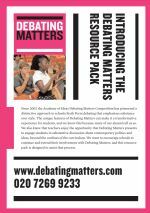 We also know that teachers enjoy the opportunity that Debating Matters presents to engage students in substantive discussion about contemporary politics and ideas, beyond the confines of the curriculum.We want to encourage schools to continue and extend their involvement with Debating Matters, and these resource packs are designed to assist that process.